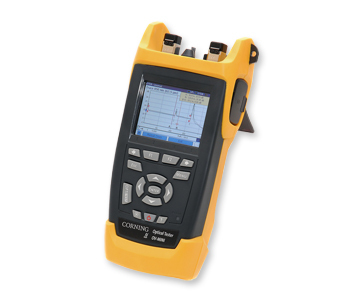 Corning OTDR MiniXK Optical Time Domain Reflectometer (OTDR) provides a rugged, handheld and lightweight solution for testing and troubleshooting fiber optic networks. This handheld Corning OTDR gives the operator the flexibility of testing single-mode and 50 and 62.5 μm multimode systems with the same unit. The OV-Mini provides complete connectivity flexibility (with USB stick compatability and USB cable download) and top user-friendliness (offering one-touch testing). Available on the OV-Mini (DK and XK options) are a power meter, Visual Fault Locator (VFL) and video inspection software. The Corning OTDR utilizes Windows® CE technology allowing for a faster power-up time of four seconds from sleep mode. The OV-Mini has a large internal memory that typically stores up to 500 traces and eliminates the need for a hard drive, which can fail under extreme field conditions. MiniXK Multimode/Single-mode OTDR with power meter and VFL, video inspection probe, separate handheld multimode/single-mode source, power supply, video inspection probe software, Li-Ion batteries, CD with OTSView PC emulation software and user’s manual, USB data transfer cable, SC and ST Compatible OTDR port, cleaning supplies and soft carrying case.